eWAVE Next Generation WDM portfolio of CWDM/DWDM, Transport and Access products enable Service Providers to deploy cost effective, next generation and fiber optic transport systems in access, metro/metro-core, and regional networks. In additionally, the portfolio utilizes the power of its advanced technology to transform traditional systems into miniaturized, simplified, and most cost efficient systems – Service Providers are now able to seamlessly and incrementally integrate Ethernet Services into their networks. By integrating WDM and SDH multiplexing capabili-ties, a fully fledged next-generation WDM transport platform is available and ready to meet the growing demand for high-speed data traffic. 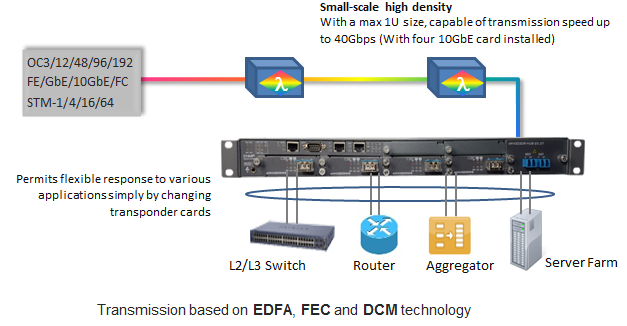 Instead of having to build and operate both a WDM network and SDH network in parallel, interconnected via expensive transpon-ders, this solution makes it possible to carry high volumes of traffic in a single, integrated network entity. Upon that, it enables the carriers to deliver more services on their installed optical fiber infrastructure by combining multiple wavelengths on a single fiber. And hence, it reduces fiber lease expenses. As a result, it's lower your OPEX and CAPEX too. Another main key of Next Generation WDM system is plug and play. It's the key to ensuring that smooth migration path from a network with only a few wavelengths towards a situation in which many wavelengths are activated. Thus, operational expenditures and risk of network failure are kept at a minimum. It can adopts Point to Point, RING and mesh topology as per your network requirements.